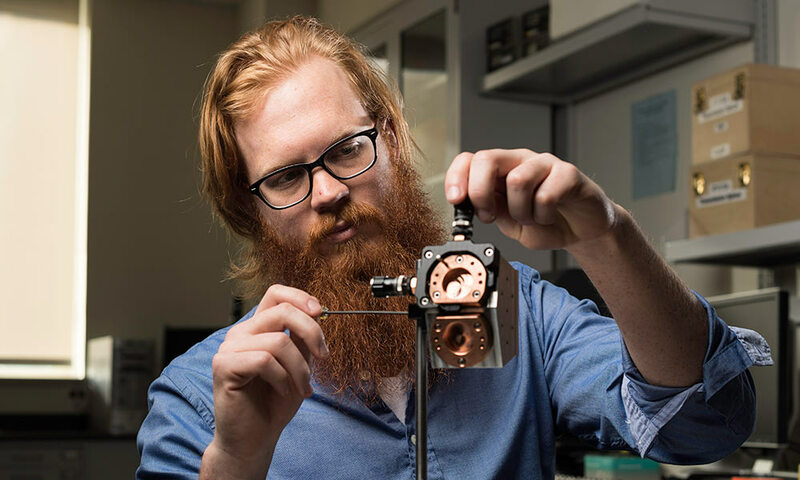 PhD student Jacob Reimers is pictured with a prototype spectrometer he designed over three years using freeform optics in the lab of Brian J. Thompson Professor of Optical Engineering Jannick Rolland. With freeform optics, computer numerical control and new diamond turning technologies, it is now possible to dispense with conventional, rotationally symmetric mirrors and lenses, and design more complicated optical surfaces that can correct the aberrations that limit field of view and resolution, resulting in optical devices that require fewer, smaller lenses and mirrors that are more effective than traditional ones. In a recent paper in Light: Science & Applications, University of Rochester researchers Jannick Rolland and Jacob Reimers describe an optical device with potential applications ranging from improved satellite and diagnostic imagery to more precisely matching the paint color on a living room wall. The device is a type of spectrometer—an optical instrument that takes light and breaks it down into components to reveal a catalogue of information about an object. Unlike traditional spectrometers, however, this one is designed using freeform optics, a relatively recent advance that upends more than a century of optical design. For more than 125 years, optical design was constrained to using rotationally symmetrical, often perfectly spherical surfaces placed in round tubes—for example, single-lens reflex cameras and microscope objective lenses. Each lens element in such a design can contribute up to 15 aberrations that limit field of view and resolution. The advent of computer numerical control and new diamond turning technology has made it both feasible and economical to design and fabricate far more complicated, freeform optical surfaces that dispense with rotational symmetry. Freeform design enables a device to efficiently correct aberrations with fewer, smaller lenses and mirrors. The result, researchers say, will be sensors, mobile displays, and a host of other devices that are not only smaller in size, lighter in weight, and less expensive—but also out-perform those containing traditional lenses and mirrors. and is 65 times more effective at correcting aberrations that affect field of view and resolution. The project is funded by the University’s Center for Freeform Optics (CeFO), a collaborative initiative funded by the National Science Foundation and directed by Rolland, which also involves the University of North Carolina at Charlotte and multiple industry partners whose membership dues fund the research. The goal of the center is to promote precompetitive projects that advance freeform optics from the laboratory to industrial applications. The spectrometer described by the two researchers is based on the Offner-Chrisp geometry, widely used by the optical industry to correct aberrations created by more conventional surfaces. The paper focuses on the science behind designing a freeform spectrometer. Another paper published in June in Optics Express, an Optical Society Journal, focused on the fabrication and testing of the convex grating. Two future papers, coauthored by researchers from both Rochester and UNC–Charlotte, will describe the fabrication of the mirrors as well as the fabrication and assembly of the full prototype. “What’s nice about what Jacob has done is to not just come up with a design, but to show the science behind it, and why it is better,” says Rolland.